Manila, Philippines - The Philippine Institute of Volcanology and Seismology (PHIVOLCS) reported a magnitude 4.4 earthquake that hit areas in Metro Manila and Luzon around 7:00 p.m. on Saturday, May 21, 2016. The exact time of occurrence was recorded at 7:14 p.m. with epicenter 14.98°N, 121.95°E - 015 km N07°W of Burdeos in Quezon. 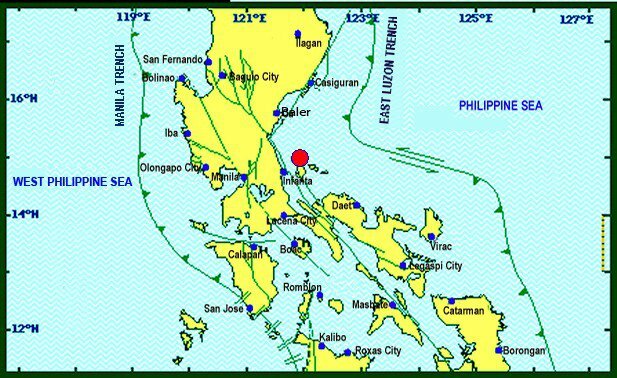 The earthquake was felt at Intensity III in Quezon City, Binangonan and Baras in Rizal. Intensity II was experienced in Malolos, Bulacan; Paranaque City, Antipolo City and Guinayangan, Quezon. Meanwhile, it has Intensity I in Tagaytay City. It has a depth of 34 kilometers and a tectonic origin. Netizens have told The Summit Express on Facebook that they felt the earthquake in the following locations: Rizal, Laguna, Bataan, Ifugao, Quirino Province, Isabela and Metro Manila areas. There is no reported damage or injury after the quake. The government bureau who monitors volcanic eruptions, earthquakes and tsunami in the country initially announced the quake has magnitude 4.5.